IND vs SA Cricket Score: India meets South Africa in the 5th One Day International Cricket match at Port Elizabeth, South Africa. The match will kick start at 4:30 PM IST (D/N) today. India has already won 3 out of the 4 games and leading the 6 match series by 3-1. They lost the 4th ODI match on Pink Day by D/L method. A win today will help team India to win the series and clinch the trophy. According to the toss report from the center, South Africa won the toss and decided to Bowl first. Due to the green pitch again, India will give more importance to their wrist spinners Kuldeep and Chahal again. They both played a major role in winning the first three ODI matches. The pitch is expected to go slower during the second innings which will give more advantage to the fielding team. Toss: South Africa won the toss and decided to Field. Match Result: India won by 73 runs. India Team: 1 Rohit Sharma, 2 Shikhar Dhawan, 3 Virat Kohli (capt), 4 Ajinkya Rahane, 5 Shreyas Iyer, 6 MS Dhoni (wk), 7 Hardik Pandya, 8 Bhuvneshwar Kumar, 9 Kuldeep Yadav, 10 Jasprit Bumrah, 11 Yuzvendra Chahal. South Africa Team: 1 Hashim Amla, 2 Aiden Markram (capt), 3 JP Duminy, 4 AB de Villiers, 5 David Miller, 6 Heinrich Klaasen (wk), 7 Andile Phehlukwayo, 8 Kagiso Rabada, 9 Tabraiz Shamsi, 10 Morne Morkel, 11 Imran Tahir. 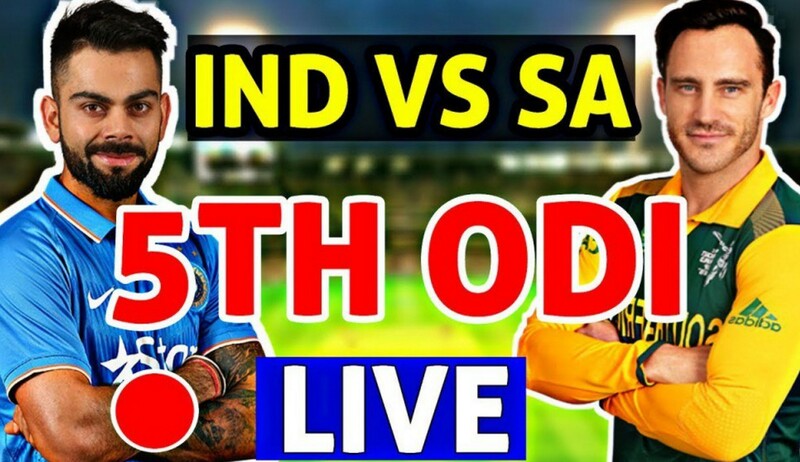 India vs South Africa 5th One Day International Cricket match Live streaming will be telecast on Sony Ten network channels. Stay tuned for Ind vs SA live cricket score updates, final scorecard, match result and highlights which will be updated on this page.